Rosemary the apartment consists of a master bedroom with private bath with bathtub and a second bedroom with three single beds and a second bathroom with shower. There is also a spacious living room with dining area and a kitchen. The apartment has a large garden with private outdoor furniture for dining out. 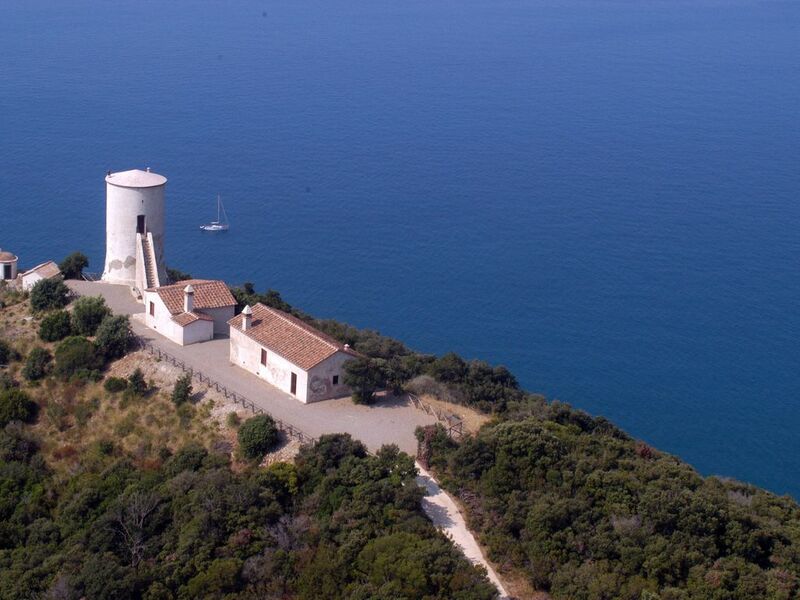 Tenuta Le Rocchette, is one of the oldest estates of Maremma. It takes its name from the Fort of rocchette, splendid fort overlooking the sea with wonderful view over the Tuscan archipelago. The entire property is managed with love and passion by the owners and is made from the Tower of the galleys, watchtower recently restored according to the ancient drawings and today made a holiday home for romantics, lovers of nature, sea and unique places. Overlooking the sea has a view indescribable. The estate also has three apartments on top of the Hill of St. John. Surrounded by greenery enjoy views of the castle and the beach of rocchette: the apartments are perfect for family holidays or friends, to relax and have fun in a special place. two bathrooms available in the apartment. One has a bathtub and the other a shower. Both bathrooms have sink, toilet and bidet. Le lieu est paradisiaque, un îlot de tranquillité, dérangé uniquement par le chant des cigales. Très belle propriété, une forêt de pins, vivante, animée (nous avons croisé une famille de sangliers...); la mer à dix minutes à pieds. Belle et vaste maison, idéale pour une famille. Le tout entretenu par la personne la plus serviable, sympathique, disponible et compétente que nous ayons rencontré, Filippo. Wir haben 8 Tage im Appartement Rosmarino verbracht. trotzdem nur 10 Minuten zu Fuss zum Strand. We spent two wonderful weeks in Ginepro, a truly enchanting and quiet location. From the hill top there is a great view on the sea, and also Ginepro has sea view. The rooms are spacious and light and decorated with taste. The kitchen has all basic equipment. The guard Filippo is very helpful. Although the road from the gate to the apartments is a bit cumbersome to drive, the distance to the beach is quite doable, also by foot. Use can be made of the swimming pool in the camping site at the foot of the hill, near the beach. Of course, a pool on the hill near the apartments would have been even nicer! A highlight was the invitation from the very kind owners for drinks at the castle. Definitely a place to come back to! Tenuta Le Rocchette is the perfect destination for all seasons. In Winter hunting activities are the masters but the quiet and charm of the winter sea is not to be missed. Fantastic walks, horse riding and cycling and much more are not to be missed. In summer we can arrange on request horse riding, booking tennis courts, spa and massage service, golf, water sports, boat trips sailing sailing or motor, sailing boats or motor boats, hiking and by bike. The water park of Follonica is just 20 minutes by car, and there are also playgrounds equipped for children just 10 minutes away from the property. The area of ​​Castiglione della Pescaia and Punta Ala is very well known for the beauty of its beaches and the clear sea also for entertainment and fun for all ages. Gli ospiti dovranno pagare il 50% dell'intero affitto al momento della prenotazione ed il saldo 30 giorni prima del loro arrivo. Qualora gli ospiti cancellassero la prenotazione 60 giorni prima dell'inizio del soggiorno perderanno esclusivamente la caparra, entro i 30 giorni prima dell'inizio del soggiorno perderanno il 50% dell'intero affitto e entro i 7 giorni prima il 100%.